Are you Clothes and Accessories Causing Your Pain? Home / Blog / Are you Clothes and Accessories Causing Your Pain? They say that the first thing a woman notices when she meets someone is their shoes. When I see a patient in chronic pain, I start with the shoes, but work my way up to the head. You would be surprised how what a person wears and the items they use to accessorize can affect or perpetuate their pain. The type of pain to which I am referring is myofascial pain, which commonly affects the muscles, fascia and joints in the neck, back and extremities. If you have some sort of chronic pain, whether it’s from an injury, repetitive strain, over overuse, more than likely there is a myofascial component. Myofascial pain is characterized by trigger points and fascial constrictions. Classic features of a myofascial trigger point include focal point tenderness, reproduction of pain upon palpation, hardening of the muscle, weakness of the involved muscle, referred pain, and limited range of motion. Myofascial pain can occur anywhere in the body. It primarily affects muscle and fascia. It can cause a variety of symptoms ranging from muscular pain that is steady, aching, and deep to headaches, jaw pain, irritable bowel syndrome, painful periods, joint pain and tinnitus (to name a few). The intensity can range from mild discomfort to excruciating. Knots may be visible or felt beneath the skin. The pain generally does not resolve on its own, even after self-care such as ice, heat and rest. The most effective way to manage this type of pain is through deep fascial manipulation, which can be done through massage or dry needling, in combination with corrective exercises and attention to perpetuating factors, some of which are mentioned below. Our feet and ankles benefit from being in a neutral position. Any deviation from neutral can affect all the joints above. Neutral is defined as straight with the knees tracking in line with the second and third toes. High heels or any other shoes that change the foot and ankle positioning will affect the length and tension of the surrounding muscles, which in turn affects the range of motion at that joint, resulting in compensation at other joints and eventually PAIN. See picture below. It’s common for men to keep their wallets in their back pockets. This practice has resulted in an alarming number of walletectomies performed each year. Keeping a wallet in your back pocket can cause pressure on the piriformis muscle. The sciatic nerve runs through this muscle and with repeated pressure, it can become inflamed, resulting in sciatic pain. Tight fitting clothing can affect the way you move. Just like a tight muscle can result in distorted posture and compensatory movement patterns, tight fitting clothes can have the same affect. 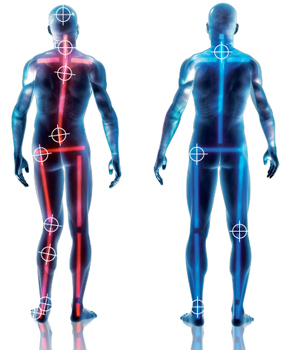 The change in movement can affect the joints above and below. A pair of tight jeans will affect movement at the knees, hips and lower back, which can result in other areas having to compensate. These area can become strained and the result? PAIN. Tight clothing can also restrict fascia, nerves and circulation. First, the straps of a purse can irritate trigger points in the trapezius muscle, resulting in neck pain and in some cases, headaches. A purse doesn’t need to be very heavy to illicit this response. Secondly, holding a heavy purse on one side can also cause your body to shift in order to compensate. This shifting can affect your posture, which in turn can cause muscle and joint problems. As you guessed, this can lead to pain. I like those bags that can be worn like a stylish back pack, which brings me to another potential perpetuating factor…heavy backpacks that our kids use to bring books, lunch and supplies to and from school. 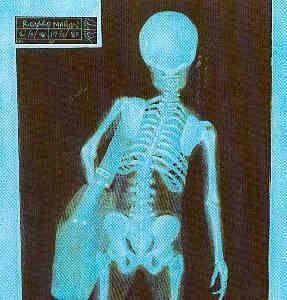 This heavy load is not healthy for the spine and can result in back pain. Using a waist strap (that is attached to the backpack) to distribute the weight on the waist can be somewhat helpful in this scenario. Sure they look shapely and give you added support, but if they are too tight, then trigger points can develop or be irritated. Add in the stress of exercise, which can lead to fatigue and poor postural awareness and you have a sure fire recipe for pain. Common areas affected include the trapezius, pectorals and upper back muscles. Hair ties and other hair accessories can pull or irritate your galea aponeurotica (GA), a muscle that covers the upper part of the cranium (skull). The GA attaches to the frontal and occipital muscles on the brow at the front and on the upper back of the head. Constant pull (even low intensity) can cause local irritation to this muscle as well as either end where it attaches. A sound kinetic chain is important for optimum alignment. What you wear as well as your posture and habits affect your alignment and at some point could cause pain.